Auto accidents happen for a variety of reasons every day but when you add wintry weather and poor road conditions to the mix, it creates an even higher risk. In 2017, the Pennsylvania Department of Transportation (PennDOT) recorded 7,349 auto accidents as a result of winter weather. These accidents accounted for 5.7 percent of total crashes documented. While it is best to try and stay off the roads when winter weather is on the horizon, sometimes that isn’t a choice. Here are a few tips to keep in mind when traveling through winter months. In typical driving conditions, 3 to 4 seconds is the ideal following distance but this should be extended for winter driving. The American Automobile Association (AAA) recommends a following distance of 8 to 10 seconds in winter weather-related conditions. In following this rule, you have the time to respond to sudden stops or slips that the driver in front of you may not have expected. It’s easy to underestimate how much snow could fall in a particular amount of time, but it is beneficial to think ahead before departing on your trip. Checking in on road conditions to see if certain roads have been plowed or if there have been vehicles getting stuck, can prevent an auto accident that you cause or are involved in. Avoiding problem-causing areas will make for a smoother and safer commute. Snow-covered and icy roads can turn a short commute into a long trip when traffic and conditions are taken into account. Running out of gas when winter conditions hit causes all kinds of trouble. Being stuck on the side of the road could lead to other vehicles colliding with yours due to road conditions and visibility. To avoid running out of gas, always make sure you have at least half a tank before heading out into winter weather conditions. Winter driving means sharing the road with snow plows. The Pennsylvania Turnpike reminds drivers to never pass a snow plow while they are in the process of clearing snow. Snow plow drivers have a very limited visibility due to the snow coming off their plow and onto the side of the road. Be safe and stay a good distance away from a plow; you’ll have better driving conditions if you’re following a plow. Always be cautious when driving in winter conditions, for yourself and those around you. While it may take longer to get your destination, it is worth taking the extra time to be safe and accident-free. Remember to go at a slower speed and try to continue moving if possible. 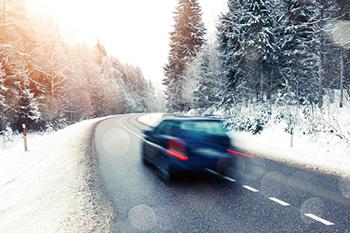 Avoid sudden stops and acceleration as this will likely lessen the control you have due to the winter conditions. If an auto accident does happen as a result of winter weather, make sure you’re in the know about how you should handle the situation. Following an accident, KBG Injury Law may be able to help you get the Results You DeserveÒ. Reach out to schedule a free consultation.